ugh! even the picture of the spider grossed me out. i had to scroll the page up so that i didn’t have to see it while i was reading the rest of your post! You have fat spiders, don’t you? Ours tend to be smaller in the body with thick, strong hairy legs. I’m not sure which spiders are worse, Toni, yours or ours. I suppose the fat ones would be noisier and messier to squish. Although we have some huge spiders here in Manitoba, my phobia of spiders started when we lived in our trailer in Caronport. Huge, bulbous, and yellow. YUCK. We had hundreds of them on the side and coming from underneath our trailer. @Toni – Spiders are all predators, but have a vast array of strategies. We have many smaller bodied, large harry legged varieties as well. The spiders like that tend to be ground hunters that leap (Jumping spiders – Family Salticidae) or wolf spiders. These spiders chase their prey and only use a web for their eggs. In the case on some wolf spiders, the female actually carries her eggs in a silk sac beneath her abdomen and when they hatch, she carries her offspring for a while as well! The fat bodied, long-legged spiders such as Marc’s specimen tend to build intricate webs and wait for their prey. When an insect is caught in the web, the spider can leisurely wander down, inject venom and dine at leisure. 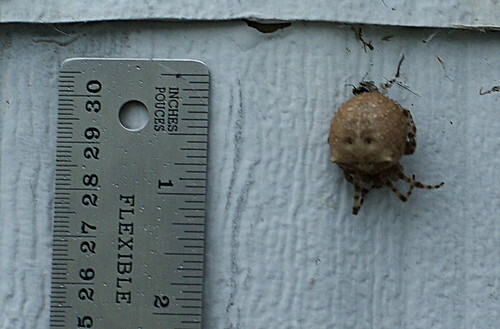 I am sure that they have orb weavers in your area, but perhaps they are not as prominent as they are in Canada in the late summer. We get some big ones! And one more: If you want information, including tips on relocating them, check this page out. I got woozy just looking at that picture. I think I need to lie down. I love the biology lesson – fascinating. Thanks Scott.